View all NST data including emails, contacts, journals, calendar, etc. Many of our business client’s information is saved in the Office 365 and we had configured in the Outlook. When the Outlook application was down, we had to continuously search for all the contacts. Thankfully, we used Kernel for NST viewer which brought back all the contacts along with emails. 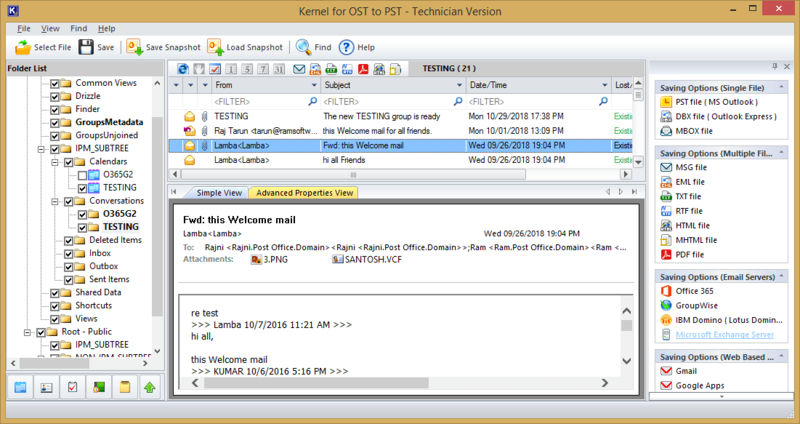 Kernel for NST Viewer is one of the rarest software which allow us to access Outlook files without even the Outlook platform. It has helped us to constantly access our emails when the Office 365 was not working due to internet outage. You can easily open an NST file directly using this tool. The tool will scan the NST file and enlist the entire the NST file content like emails, contacts, notes, journal, etc. The tool also lets you access email attachments. In case, if you are not familiar with the location of NST file, then use the Search feature of the NST viewer tool. After you input the drive or folder where you want to search, the tool will search for the NST files to enlist them. You can select and view content from an unlimited number of NST files using this tool. You can add multiple NST files with the help of + button on the user interface. There is a Find option in the software which lets you search for specific emails. There are multiple filter criteria like From, To, Subject, date range, attachments, etc. by which you can find the required emails. The tool is quite capable of handling any NST file whether it is healthy or corrupt. It will open NST file without any issues. As the software is a viewer file, you can view and save the complete list of the email in the NST file. You can also copy and print the email in an HTML format. The NST viewer tool lets you generate detailed file analysis reports to get an idea about the content of the NST file. The free NST Viewer tool extensively supports all the versions of Microsoft Outlook (2016\13\10\07\03\02\2000\98\97) and all types of NST files. 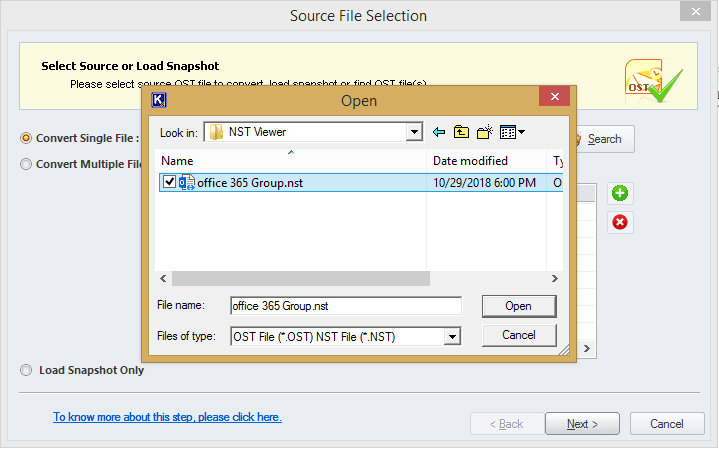 What is an NST file in Outlook? An NST file is a storage file like OST and PST files. But an NST file is generated when you configure the Outlook application with an Office 365 account. As soon as Office 365 account is configured in the Outlook, an NST file is generated for its storage. The NST file stores items like emails, contacts, calendar, notes, etc. If you configure a Lotus Notes account in the Outlook, then again, an NST file will be created for storage. NST Viewer tool – What need does it fulfill? 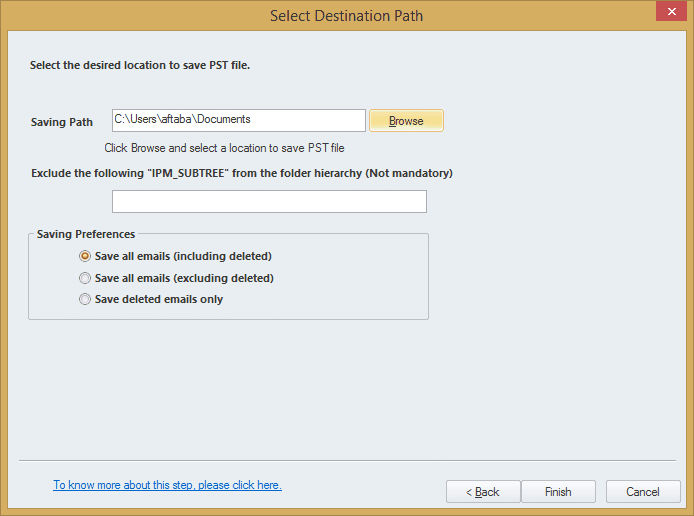 Can I find the location of NST file from Outlook? Select your email account in the Outlook and right-click on it. Then select the last option of Data File Properties. 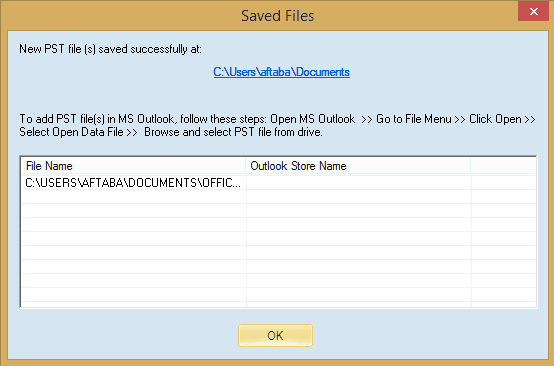 In the next option, click Advanced and then click Outlook Data File Settings. Copy the location URL and paste it in the Windows Explorer. 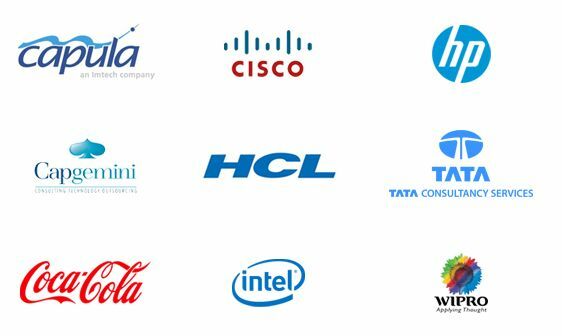 After pasting the URL, remove the part till Outlook and press Enter. The location which opens has a file with the extension (.nst). Does the tool has any size limitation for the NST file? There is no size limitation for any NST file. You can easily open a large sized file using this tool. What are the various reasons which cause corruption in NST file? Open Kernel NST Viewer and browse the NST files. Get a clear preview of your NST file. Set the destination location for the newly created file. The file is successfully saved at the selected location.